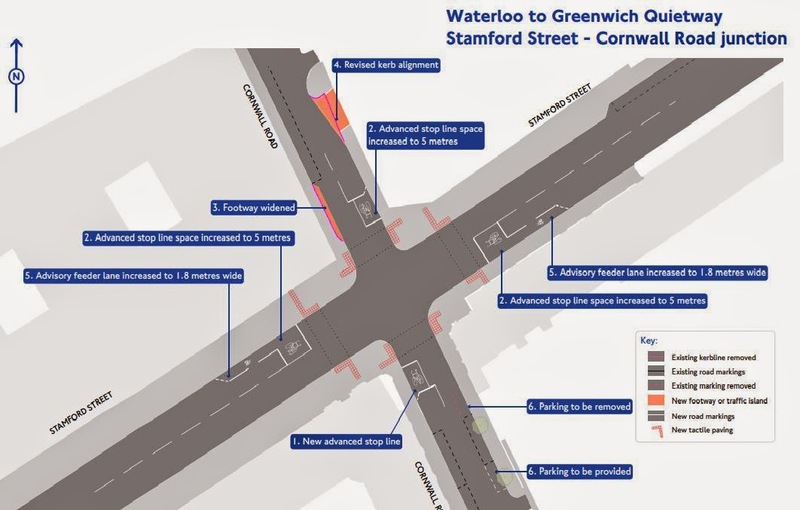 TfL have just opened a consultation about a Lambeth junction, where Cornwall Road crosses Stamford Street, on the Quietway which will run between Waterloo and Greenwich. Subject to the outcome of this consultation, TfL plan to start construction work in early 2015. The consultation runs until 9th February. TfL's consultation page doesn't include a map to show where the route in Lambeth will run, but the SE1 website put up a piece on Tuesday stating that, "In SE1, the Quietway route will run from the South Bank via Cornwall Road and Webber Street to Great Suffolk Street and Trinity Street". Unlike Southwark, Lambeth has not yet published, and consulted on, the proposals they have for the Quietway on their streets. Without knowing the wider plan in Lambeth there are limited comments one can make on an individual junction. So, while I urge people to comment, it may be worth waiting a while for the borough's plans to be published. https://consultations.tfl.gov.uk/cycling/cs-5-harleyford-road giving your views, even if a one line 'I support TfL's plans', on the proposed Cycling Superhighway 5 route (blue below). 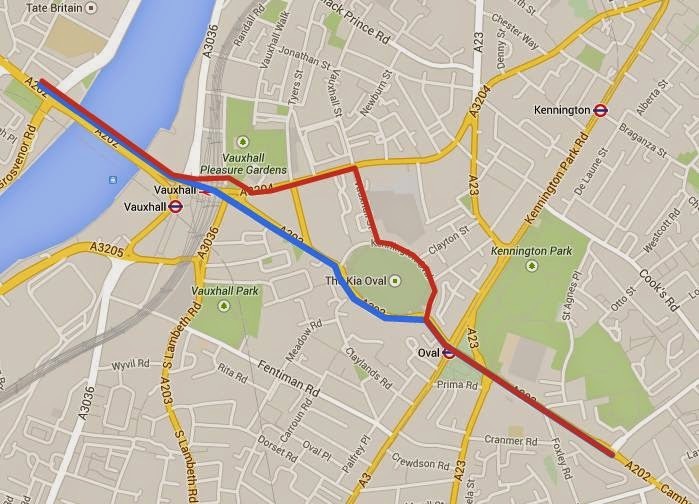 I'd also strongly suggest that you also ask TfL to REJECT the plan in red below, submitted in a letter by the Chair of the board of the Kennington, Oval, Vauxhall Forum, which proposes that CS5 diggles around the back of the Oval, along the Inner Ring Road (Kennington Lane), across the road and behind the Royal Vauxhall Tavern then over the bridge. which were brought out at our Public Meeting you so kindly attended. Vauxhall One, the Business Improvement District for our area. thinking through the consequences of the proposals. only would the buses be significantly slowed so too would other traffic. sitting idle for longer periods of time. delays on most journeys thus increasing carbon emissions. Vauxhall Bridge will continue to cut through the pedestrian tunnel on the station side. Lambeth Road. Only a minority will use the pedestrian tunnel on the RVT side. longer makes sense on Harleyford Road. show the likely impacts of CS5. – other than which side of Harleyford Road it could travel. as a result of reduced road widths. significant difference to their travel time. serious further consideration if CS5 must be delivered. for the majority of cycle journeys. alternatives as a more cost-effective and improved offer. Here's a little trawl from a Google search on Small Business Saturday (this weekend). Lots of free parking this Saturday, and the occasional bus offer. No mention of a more frequent bus service, inducements to cycle etc. My guess is that quite a few of the free parking spaces will be fully occupied by staff of the small businesses. Parking in Taunton’s 19 town centre car parks will be free from 2pm for the rest of the afternoon on Saturday, December 6. The park and ride service operating at Taunton Gateway and Silk Mills, is offering a shoppers special on Saturdays leading up to Christmas with a discounted ticket of £1.50 for up to five people travelling together. Shoppers and visitors to Oakham and Uppingham can enjoy free parking after 10am on Saturday, December 6, as part of Small Business Saturday. East Lindsey District Council car parks will be free to use on December 6, in a council drive to help support local businesses. PARKING in Bishop's Stortford will be free all day next Saturday (December 6) to celebrate Small Business Saturday. Free festive parking will come into effect next month, as Mendip District Council’s Cabinet has agreed to support Small Business Saturday by providing free all day car parking at the following car parks on December 6. Free festive parking will come into effect next month, as Mendip District Council’s Cabinet has agreed to support Small Business Saturday.